This is the look of shame that belongs to Maya, my nine year old boxer, the naughty canine who left teeth marks in SHIVER. We took the kids on a ski vacation during winter break and had a friend come to the house to watch her. Was Maya appreciative that we hired someone to feed her three times a day and walk her so she wouldn't be exposed to all those yelping dogs and the kennel cough that left her hacking like a chain smoker the last time she stayed at Petsmart? No! She repaid me by munching on my library book. 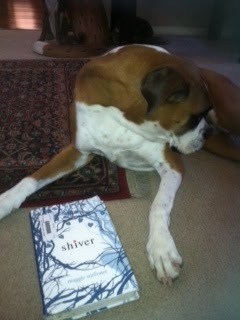 I do think it's noteworthy that the book SHIVER by Maggie Stiefvater is about a teenage boy who is a werewolf. If I give Maya the benefit of the doubt, maybe she read the reviews and just wanted to take a peek inside. The only thing more embarrassing than being fifteen years old and having to tell your librarian that your dog ate your book is to be an adult who works at the school. I did mention that I had ordered a fresh, new, unchewed copy which I would deliver as soon as it came in. I adored this book. The writing was so beautiful and lyric and the plight of Sam, the boy who fights to stay human for Grace, the girl he loves, was so compelling that as soon as I read the last page, I turned back to Chapter One and started reading it all over again. Then it was time to leave for Colorado. 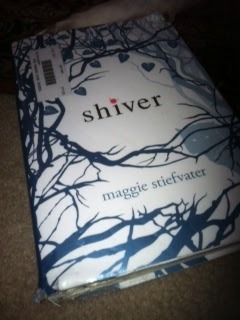 On the bright side, I now own a copy of SHIVER. Even if it is slightly damaged. And now I may reread it as many times as I want. Do Fiction and Non-Fiction Share a Common Core? Today I'm over at the Spellbinders Blog talking about the YALSA (Young Adult Library Services Association) Literature Symposium in St. Louis. The authors on our panel discussed the types of non-fiction sources that we use while working on our novels and made several suggestions for incorporating non-fiction into the reading of fiction in the classroom. The Common Core Standards put a much greater emphasis on non-fiction, but there are many ways to use non-fiction to extend the reading of novels and short-stories. For a full discussion, head over to the Spellbinders Blog.